New Zealand’s Corey Anderson is bowled out for 39 runs as Bangladesh wicketkeeper Mushfiqur Rahim watches during their Cricket World Cup Pool A match in Hamilton, New Zealand. Bangladesh’s Nasir Hossain takes a catch to dismiss New Zealand batsman Luke Ronchi during their Cricket World Cup Pool A match in Hamilton, New Zealand. 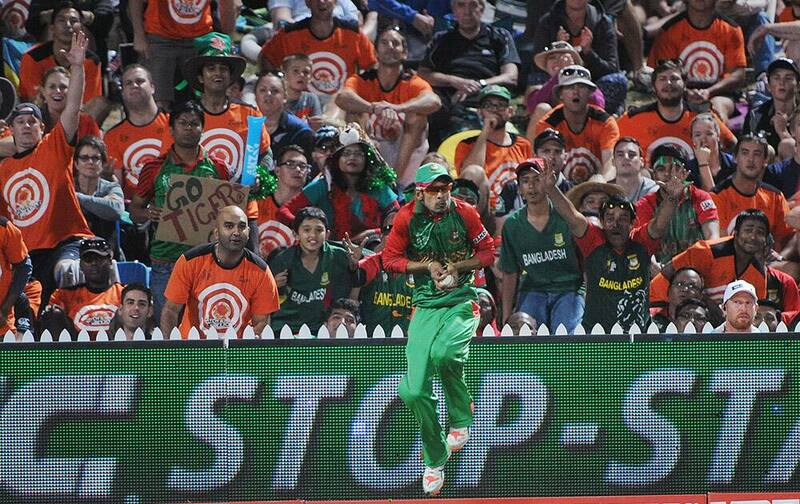 Bangladesh bowler Nasir Hossain celebrates after taking the wicket of New Zealand’s Ross Taylor during their Cricket World Cup Pool A match in Hamilton, New Zealand. New Zealand’s Grant Elliott hits the ball as Bangladesh wicketkeeper Mushfiqur Rahim watches during their Cricket World Cup Pool A match in Hamilton, New Zealand. New Zealand’s Martin Guptill reacts as he suffers cramps while batting against Bangladesh during their Cricket World Cup Pool A match in Hamilton, New Zealand. 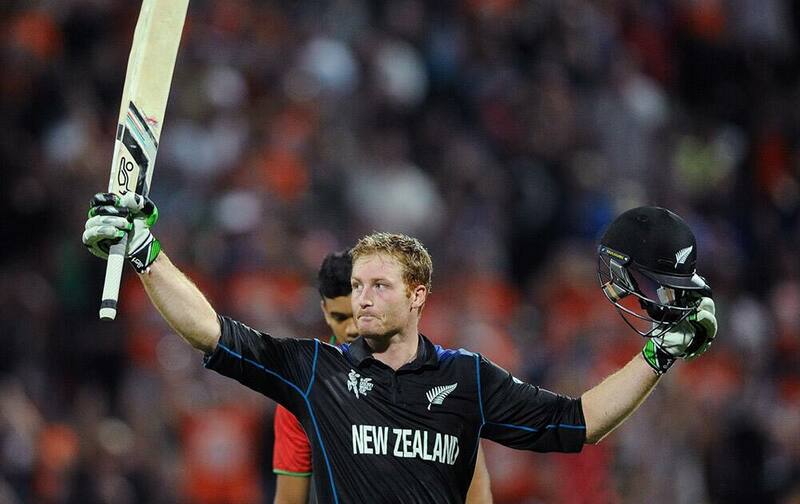 New Zealand’s Martin Guptill waves his bat as he celebrates after scoring a century while batting against Bangladesh during their Cricket World Cup Pool A match in Hamilton, New Zealand. 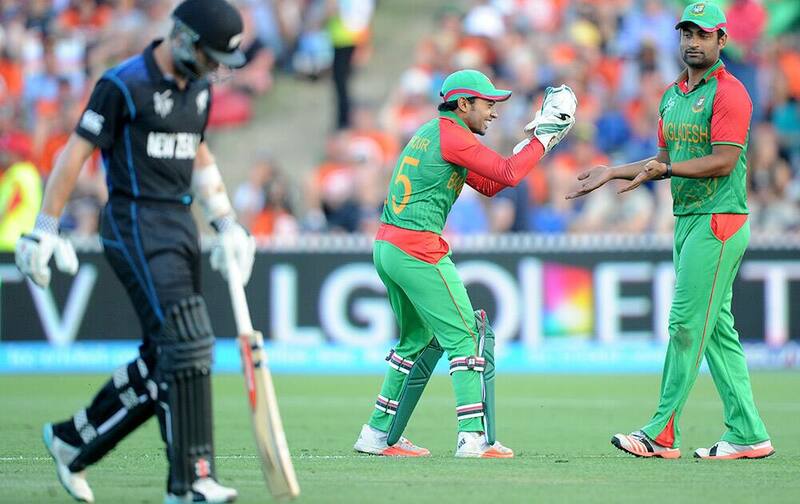 Bangladesh’s Mushfiqur Rahim congratulates teammate Tamim Iqbal after he took the catch to dismiss New Zealand’s Kane Williamson during their Cricket World Cup Pool A match in Hamilton, New Zealand. Bangladesh bowler Shakib Al Hasan, left, is congratulated by teammates Nasir Hossain and Mushfiqur Rahim, right, after taking the wicket of New Zealand’s Brendon McCullum during their Cricket World Cup Pool A match in Hamilton, New Zealand. 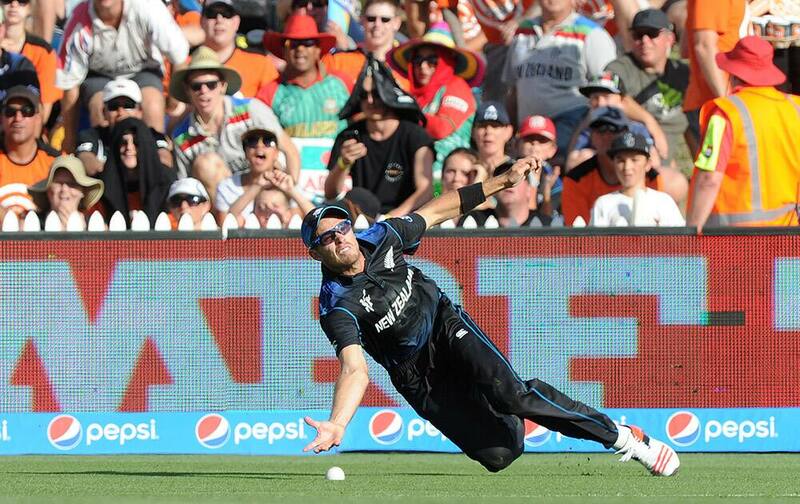 New Zealand’s Tim Southee drops a catch chance during their Cricket World Cup Pool A match against Bangladesh in Hamilton, New Zealand. 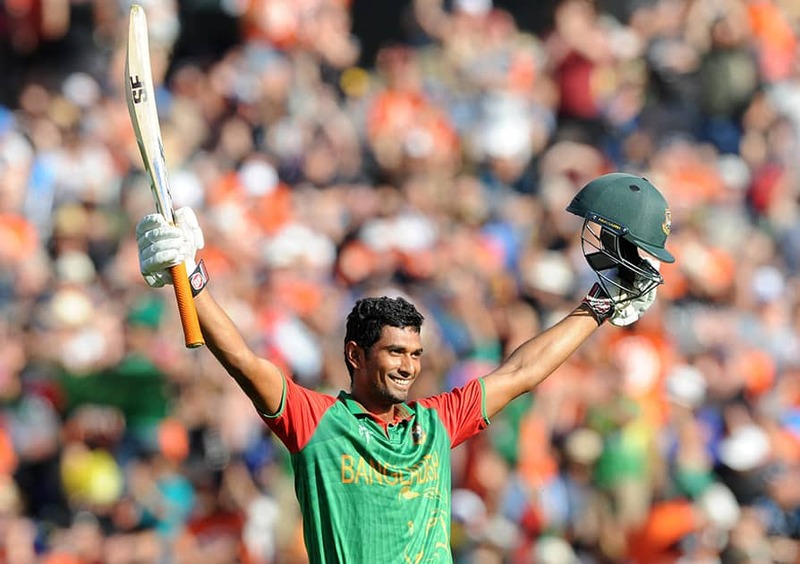 Bangladesh’s Mahmudullah celebrates after scoring a century while batting against New Zealand during their Cricket World Cup Pool A match in Hamilton, New Zealand. Bangladesh’s Shakib Al Hasan walks from the field after he was dismissed for 23 runs while batting against New Zealand during their Cricket World Cup Pool A match in Hamilton, New Zealand. Bangladesh’s Mahmudullah and teammate Sarkar Soumya run between the wickets during their Cricket World Cup Pool A match against New Zealand in Hamilton, New Zealand. 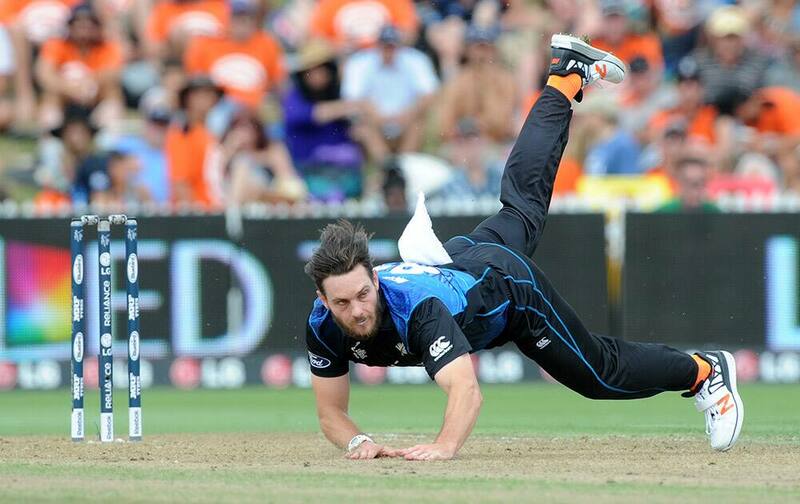 New Zealand's Mitchell McClenaghan falls while bowling during their Cricket World Cup Pool A match against Bangladesh in Hamilton, New Zealand. Bangladesh’s Mahmudullah swings at the ball while batting against New Zealand during their Cricket World Cup Pool A match in Hamilton. Bangladesh's Imrul Kayes looks around to see that he is bowled for two runs during their Cricket World Cup Pool A match against New Zealand in Hamilton, New Zealand.